While cocoa powder is a very common baking ingredient, the science of cocoa powder is often overlooked. For exceptional results, it is important to be aware of the various kinds of cocoa powder and to know how each type is used most successfully in baking. 1 What is Cocoa Powder? Have you ever wondered how exactly cocoa powder is made? It is actually the byproduct of making cocoa butter.The process of extracting cocoa butter from roasted cocoa beans leaves behind a cake of cocoa bean solids. These cakes of cocoa bean solids are then processed into a fine powder that is referred to as cocoa powder. The cocoa bean solids actually contain the majority of the chocolate flavor and therefore cocoa powder has a very concentrated chocolate taste. Baking Science Fact: While most of the fat from the beans is extracted during the process of making cocoa butter, not all of it is. For this reason, cocoa powder ranges in fat content anywhere from 8%-26%. Unsweetened cocoa powder, the kind that is used in baking, is produced in two main forms: natural cocoa powder and dutch-processed (also called dutched or alkalized) cocoa powder. The main difference in these two categories of cocoa powder is the acidity, which I will go more in depth about below. When baking, it is important to understand the difference between natural and dutch-processed cocoa powder. Choosing a cocoa powder in the wrong category for a recipe can drastically effect the success of your baked good. Natural cocoa powder is made from the cocoa bean solids after cocoa butter has been extracted from roasted beans that have not been treated with an alkaline substance. Cocoa beans are naturally acidic, therefore natural cocoa powder is also acidic, with a ph around 5. Natural cocoa powder has a bitter taste and a deep chocolate flavor. I find natural cocoa powder to taste brighter and fruitier than dutched cocoa powder. Because it has not been alkalized, natural cocoa powder is typically lighter in color than dutched cocoa powder. Note: It is important to note that not all natural cocoa powder is specifically labeled as such. In order to identify if your cocoa powder is natural cocoa powder, look at the ingredients on the label. Natural cocoa powder should list “cocoa” or “cocoa powder” as its only ingredient. Dutch-processed (also known as dutched or alkalized) cocoa powder is made from cocoa bean solids after cocoa butter has been extracted from roasted cocoa beans that have been treated with potassium carbonate, which neutralizes the acidity in the beans. In contrast to the acidic ph of 5 of natural cocoa powder, dutch-processed cocoa powder has a ph of 7 or 8. The process of adding the alkaline substance to the beans produces a darker color and reduces the bitterness. While the darker color of dutch-processed cocoa powder may visually appear more chocolaty, its chocolate flavor is more mild than in natural cocoa powders. 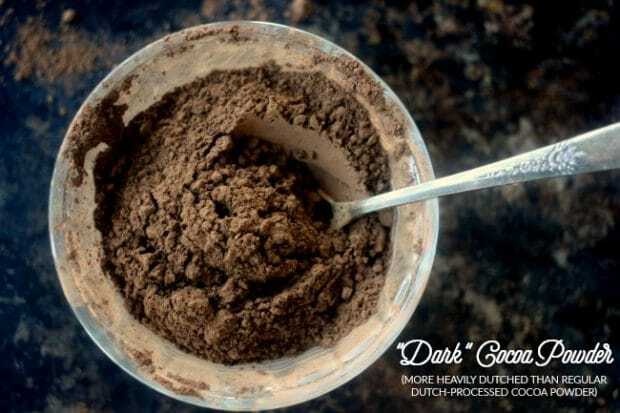 Dutch-processed cocoa powders vary in color from light to very dark and the chocolate flavor is actually more mild with the darkest cocoa powders. While the chocolate flavor is technically less intense in dutched cocoa powder, I find the flavor to be more rounded and complex than natural cocoa powder. To test which you prefer you could mix a little of each with some hot water and sugar (to make it more palatable) to taste the differences! Note: It is important to note that not all dutch-processed cocoa powder is specifically labeled as such. In order to identify if your cocoa powder is dutch-processed, look at the ingredients on the label. Dutch-processed cocoa powder will list the cocoa powder as “alkalized cocoa powder”, “dutched or dutch-processed cocoa powder” or will state “cocoa powder processed with alkali”. A recipe that has been written properly should specify which cocoa powder to use. It is best practice to always use the type of cocoa powder that the recipe calls for. 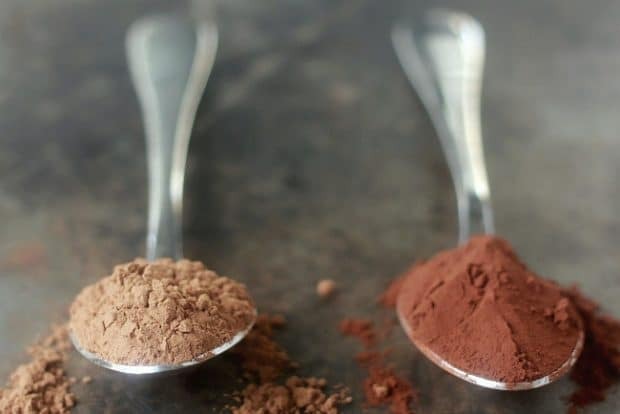 If you do happen upon a recipe that does not specify which kind of cocoa powder to use you can use the following guidelines to decide which cocoa powder would work best. The main thing you need to pay attention to is the leavening agent used. 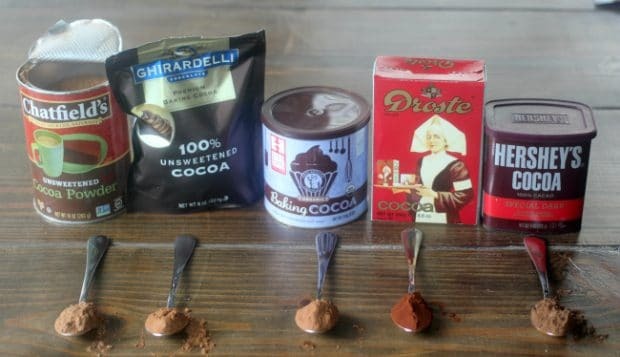 Typically natural cocoa powder will work best in a recipe that calls for baking soda. Baking soda’s makeup is alkaline and in order for it to do its job, make your baked goods rise, it needs an acidic component to react with. Because natural cocoa powder is acidic, it is likely going to be the most successful in a recipe calling for baking soda. 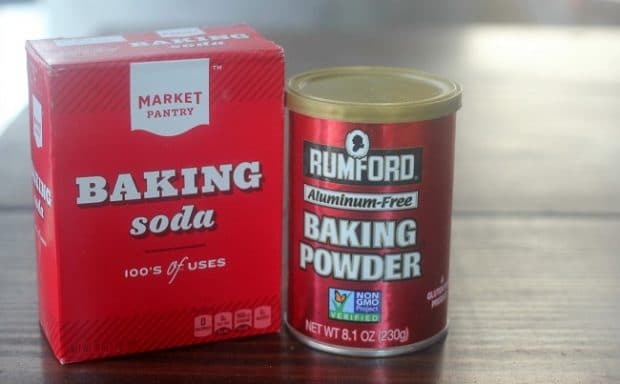 Baking Tip: If a recipe calls for baking soda and also includes another acidic ingredient in a sufficient quantity, you can likely use natural or dutch-processed cocoa powder in that recipe. Common acidic baking ingredients include: buttermilk, lemon juice, brown sugar, molasses, and cream of tartar. If a recipe uses baking powder as its leavening agent, you can use either natural or dutch-processed cocoa powder in your recipe. Because baking powder does not require an acidic ingredient to do its job, make your baked goods rise, the cocoa powder only serves to flavor and give structure to your baked goods. This is an instance in which you may decide you just prefer one over the other. This scenario is the same as a recipe calling for baking powder. If your recipe does not call for either baking soda or baking powder then it is your call on if you use natural cocoa powder or dutch-processed cocoa powder. Note: You may have noticed from the scenarios above that I did not list an instance where natural cocoa powder could not be used. While dutch-processed cocoa powder can not be used in instances where the recipe needs an acidic component to activate the baking soda, natural cocoa powder will work in any scenario. 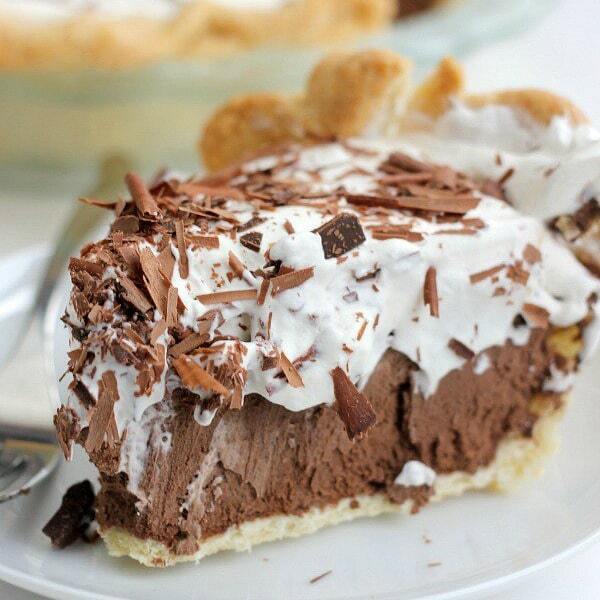 However, it is important to note that the chocolate flavor will be more acidic when using natural cocoa powder in a recipe that does not use baking soda to neutralize the flavor. It might also be helpful to think about how strong of a cocoa flavor you want in your recipe. Dutch-processed cocoa powders might be preferred in a recipe where the cocoa is a supporting flavor and not the star ingredient. 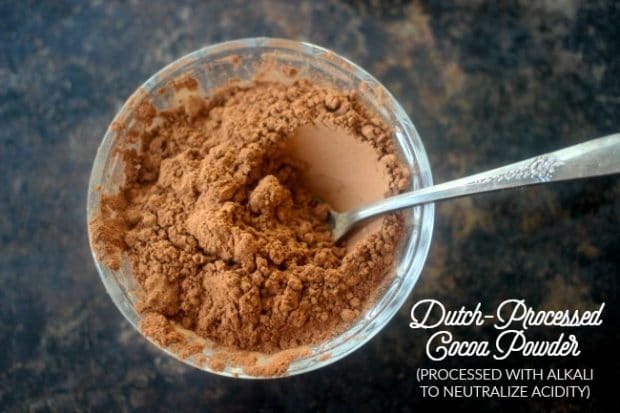 While you can technically use natural cocoa powder in any recipe calling for dutch-processed cocoa powder, adding a pinch of baking soda to the recipe will help neutralize the acidic flavor of the natural cocoa powder. For every 3 TBSP of dutch-processed cocoa powder you are substituting use 3 TBSP natural cocoa powder plus 1 pinch of baking soda. If a recipe specifies using natural cocoa powder it likely needs the acidity in the recipe to be successful. To substitute natural cocoa powder with dutch-processed cocoa powder add a pinch of cream of tartar or 1/8 tsp of lemon juice or vinegar for every 3 TBSP of cocoa powder in the recipe. 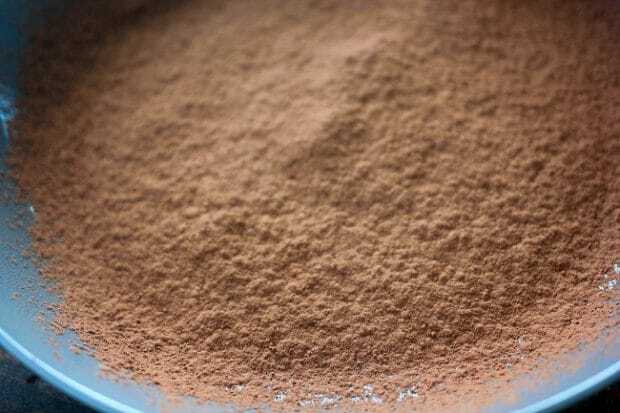 Double-dutch cocoa powder, also sometimes labeled as “dark cocoa powder,” is cocoa powder that has been more heavily alkalized than traditional cocoa-powder. The color is darker and appears more chocolaty, but actually has a more mild chocolate flavor. This cocoa powder is useful when you are looking for a richer chocolate color in your baked goods. Note: While some cocoa powders may be labeled as “dark cocoa powder,” be aware that this is not the same idea as dark chocolate. Dark chocolate refers to chocolate that is made without milk and contains a high percentage of cocoa, while dark cocoa powder is referring to cocoa that is darker in color due to being more heavily dutched. Dark cocoa powder is actually more mild in chocolate flavor than other cocoa powders that are lighter in color. Black cocoa powder has been even more heavily dutched than double-dutched cocoa powder, and is essentially black in color. This cocoa powder is used when you want your baked goods to have a very dark color. 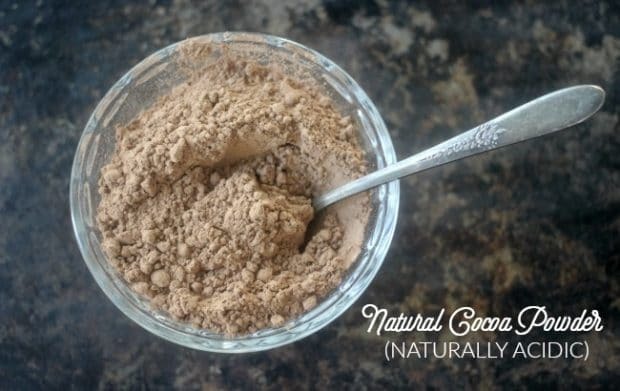 Oreos are the perfect example of when this cocoa powder is used. While it is very dark in color, the chocolate flavor is very mild. There are various cocoa powders that are a blend of dutch-processed and natural cocoa powders, such as Hershey’s Special Dark Cocoa Powder (a mix of double-dutched cocoa powder & natural cocoa powder) and King Arthur Flour’s Triple Cocoa Blend (blend of black cocoa, dutched cocoa, and natural cocoa). These are quite useful if you only want to keep one kind of cocoa powder on hand. The benefit of the blend is that it works well in recipes that need the cocoa powder to be acidic, but the combination of the cocoas rounds out the flavor profile and darkens the color. Cocoa powder is ground extremely fine, therefore it has a tendency to clump. 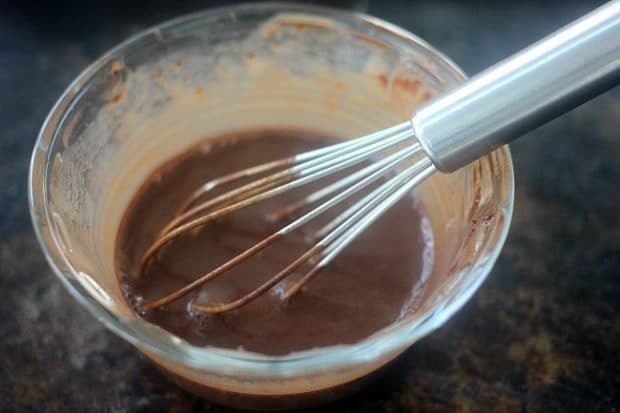 It is wise to either sift the cocoa powder or whisk it with your other dry ingredients before adding it to your recipe, especially if the recipe does not call for “blooming” the cocoa powder. If you have baked with cocoa powder much, you may notice a trend in recipes calling for boiling water or another hot liquid to be poured into the cocoa powder before adding it to a recipe. This is the process of blooming the cocoa powder. Blooming the cocoa powder helps to intensify the chocolate flavor by releasing flavor that is trapped in the solid particles. When the hot liquid is mixed with the cocoa powder it dissolves quickly and thickens up. This can be done with hot water, hot milk, hot coffee, or hot fat. If your recipe does not call for blooming your cocoa powder, but you want to do so to intensify the chocolate flavor, you can warm your liquid ingredient and mix it with the cocoa powder and allow it to cool before adding it to the other ingredients. 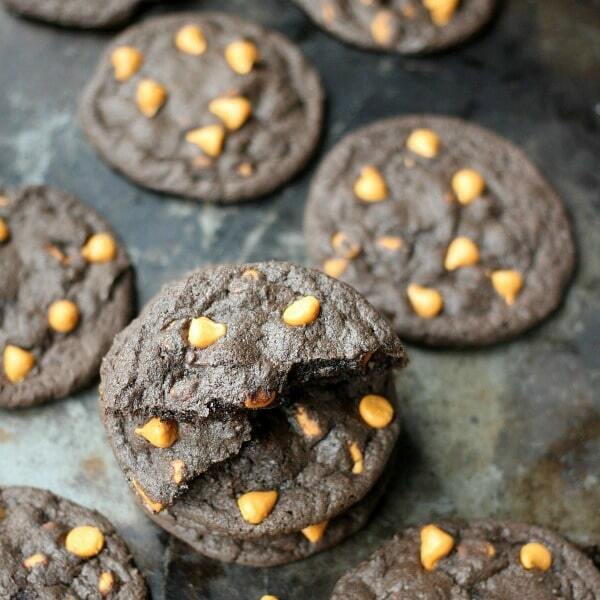 However, this would not work in a recipe that does not have a liquid ingredient or liquid fat, like many cookie recipes for instance. 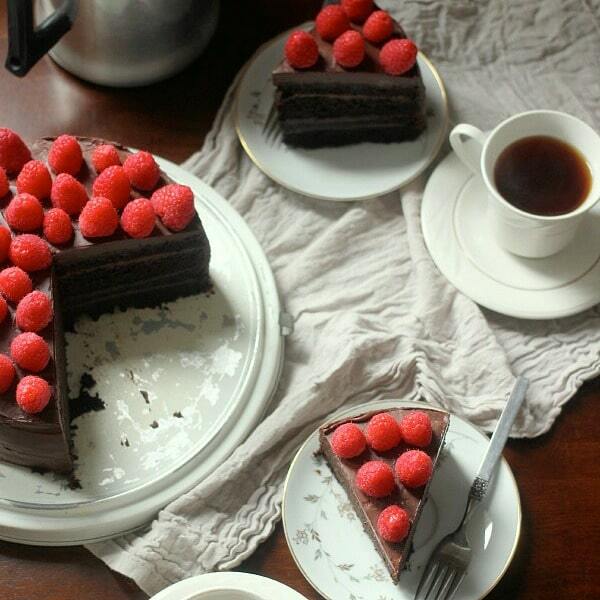 It is no secret that coffee and chocolate work beautifully together. What you might not know is that even if you don’t like coffee, it can make chocolate taste more chocolaty! 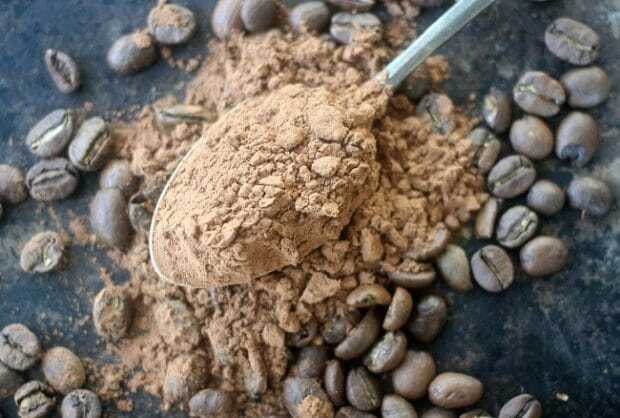 I love to keep instant espresso powder in my pantry and whisk a teaspoon or two into my cocoa powder before using it in my recipe. I promise it won’t taste like coffee! Cocoa powder is best stored in a dry, cool, and dark place. It is best not stored in the refrigerator of freezer because the moisture could cause spoilage. If stored properly, cocoa powder is good for up to 3 years. 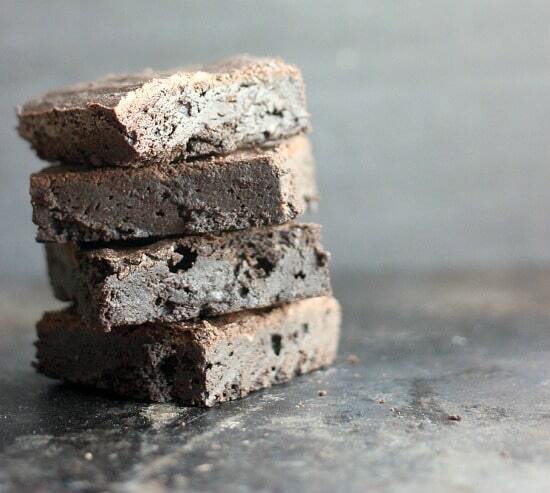 Below are a few of my favorite recipes that utilize cocoa powder for you to enjoy! I have a personal vanilla cake recipe which I want to change to chocolate, the recipe calls for 308 grams cake flour to 2.5 teaspoon of baking powder.